With more than nine years of experience, Audry O’Toole offers exceptional dental hygienist care at Barron Family Dental. As a key member of the Barron Family Dental team, Audry embraces the opportunity to provide patients with thorough but gentle dental care. Audry graduated with a Degree in Associate of Applied Science (A.A.S.) in Dental Hygiene from the Community College of Denver in 2008, has a License in Local Anesthetics, and is trained in Diode Lasers. Audry received the Hu-Friedy Golden Scaler Award for her ability to provide excellent and compassionate dental hygiene care. As a champion of patient advocacy, Audry works with clients to help them embrace and undertake good oral care and home hygiene for a healthier smile. Audry’s expert dental hygiene skills allow patients to receive regular, high-quality cleanings that help patients establish a healthy foundation to maintain outstanding oral health. Audry is a Colorado native and lives in the Arvada area with her husband and young children. As a family, they explore all the adventures Colorado has to offer! Audry and her daughter love to bake traditional German tortes and even took home 2nd prize at the Arvada Harvest Festival! Alexis is a Colorado native, holding her Bachelor’s Degree from the University of Colorado at Boulder, and her Associates in Dental Hygiene. She has been in the dental field for 8 years, beginning her debut in high school interning and realizing this was the perfect field for her! She is very compassionate and always wants to make sure her patients are taken care of and will go above and beyond for anyone to ensure they are happy! She recently got married to her husband, Kyle, and is very family oriented. She played competitive softball growing up and actually met her husband continuing to play in co-ed softball as an adult! If she isn’t here, you may see her on the ball fields or with family! With a Dental Assistant Certificate from Kaplan College, Alekz offers patients thorough care and attention with any Barron Family Dental checkup or treatment. Alekz creates lasting patient relationships and enjoys being part of the Barron Family Dental team that strives to deliver the best overall dental experience. Alekz was born and raised in the terrific Thornton, Colorado community. Alekz is married to a Marine Corp veteran and they are expecting their first child. She is also the proud owner of Maltipoo Maltese and Poodle mix, named Bella! Alekz and her family enjoy spending time outdoors, especially in the summer, taking in all that Colorado has to offer. 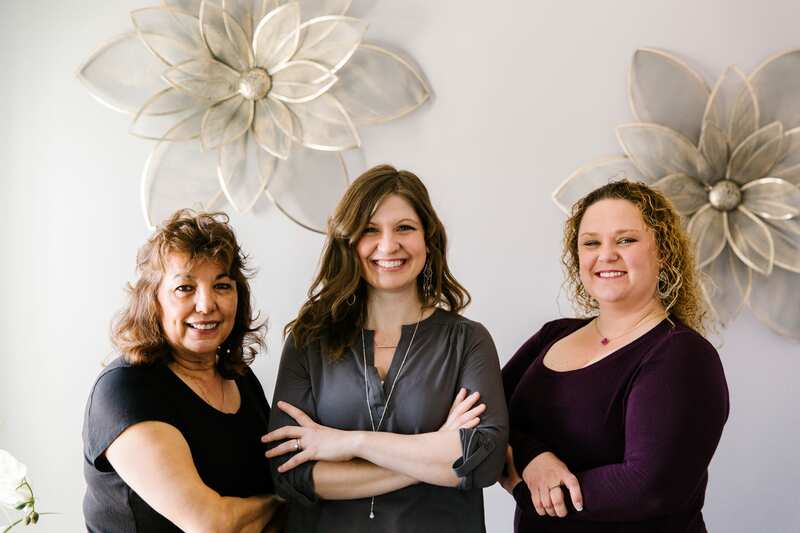 With more than 16 years of experience in exclusive cosmetic dental treatments, Lupe offers Barron Family Dental patients the highest of treatment and care. Lupe holds a Dental Assisting certificate and Expanded Duties Dental Assistant (E.D.D.A.) certificate from the University of Colorado Dentistry School. Lupe enjoys her role as E.D.D.A. at Barron Family Dental including the opportunity she has to help patients receive the best treatment available. Lupe was delighted to join the practice after working previously with Dr. Jessica Barron. Lupe especially enjoys the warm and caring environment offered to patients and strives to always make patients feel comfortable and part of the Barron Family Dental family. A Colorado native, Lupe has raised two children and now enjoys spending time with her two grandsons and two granddaughters! You can find Lupe regularly cheering on the Denver Broncos football team or attending one of the many amazing shows and events held in Denver.